On December 1, 2008 I blogged about my doctoral dreams and how I plan to apply for programs starting on December 1, 2009 — my “PhD-Day.” I also featured photos and a video of a graffiti-laden delivery truck on which the letters “P-H-D” are spray painted on the roll-top door. I have decided to call this truck the “PhD-Mobile” (like “Batmobile” but for academics). I have intermittently encountered the “PhD-Mobile” and interpret it as a sign that pursuing a doctorate is the right path for me. I started seeing this truck in March 2008 when I was driving to and from the DeVry Center in Bakersfield, CA where I have been an adjunct professor since October 2007. I am sure these letters are just some tagger’s initials, but to me they represents my dream of earning a PhD by studying the impact of social media on the management and marketing of knowledge (possibly with a focus in the health care industry). With regard to that process, I am now evaluating disciplines in which to conduct my research. The leading contender is Communication, although Marketing and Information Science remain possibilities. You can track my progress in my PhD-Day Diary. 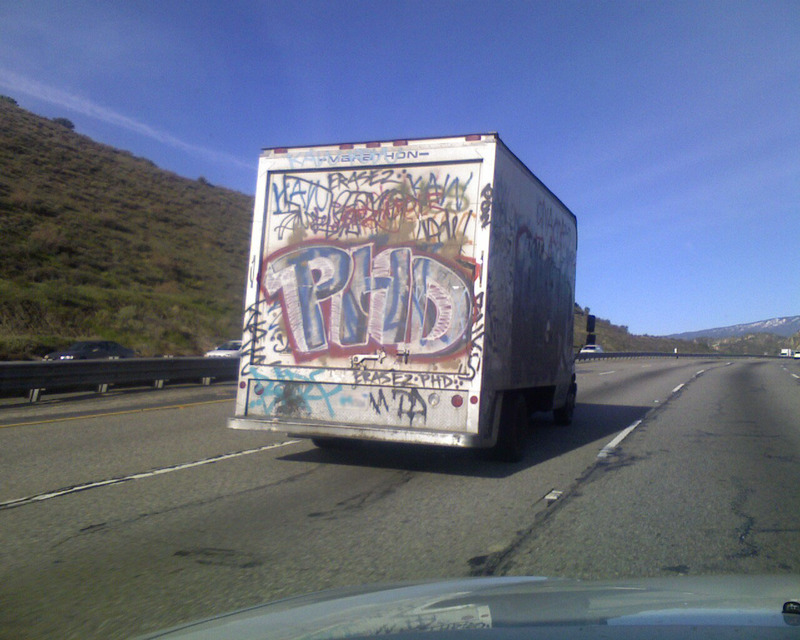 After a long period during which I did not see the “PhD-Mobile” I saw it again during the morning of February 24, 2009! I happened upon it while driving on Interstate 5 North (near Pyramid Lake) from my home in Santa Clarita, CA to DeVry University (as has been the case in the past). A photo of the same truck follows. Note that the truck was driving so slowly in order to get this picture (after initially getting the video, above) I had to exit Interstate 5 at Pyramid Lake, wait for approximately five minutes and then, once I saw the truck pass by, re-enter the freeway. The timing of the sighting was auspicious as it was two days after my birthday and right after I had been evaluating my options. I had also taken a practice GRE on Sunday (my actual birthday) so my mind was very pre-occupied with thoughts related to the doctorate. I guess this was a reminder that I am headed in the right direction! I recently taught a buying behavior class for UC Santa Barbara Extension and one of the two books I had my students read was “Buyology” by Martin Lindstrom (the other was “The New Rules of Marketing and PR: How to Use News Releases, Blogs, Podcasting, Viral Marketing and Online Media to Reach Buyers Directly” by David Meerman Scott). This unique book reports the results of the world’s largest neuromarketing study ever conducted and this presentation highlights the main points discussed in the book — it’s both fascinating and disturbing. Please review the PowerPoint presentation below (available via SlideShare). I trust you will find the information presented in the book to be quite compelling. Earlier this month, while driving home on Interstate 5 south from DeVry University in Bakersfield, I received an unexpected call on my cell phone from a woman named Tina Sarkissian, a segment producer for a new show called “Pranked” that will soon be airing on MTV. By some kind of voodoo — or maybe it was just Lexis-Nexis — she determined “Matt Gilbert” either created the video (using the pseudonym “GoogTube“) or he was somehow involved with the production of the tape. My name and phone number was on her “hit list” of Matt Gilberts (there are 453 of us in the United States, according to HowManyofMe.com). As much as I wanted to claim credit for the video, I had nothing to do with it. However, considering my interest in social media, and the fact that I am a member of the “Matt Gilbert” club, I offered to spread the word and, hopefully, help her find the right guy. So, if you are “the” Matt Gilbert responsible for the above video — or know the one who is — please contact Tina Sarkissian at “tina [at] cherisundae [dot] com” or via Cheri Sundae Productions at (323) 785-7300.